Creating printed pieces that look great and also get your message across can be a balancing act. Our team is skilled at creating attention-getting Brochures, Banners, Direct Mail, Business Stationary, and more. Each product stands on its own while maintaining branding consistency, a concept often overlooked by some designers. Our design specialists focus not only on what looks good, but also on what best represents your company and the message you want to convey. 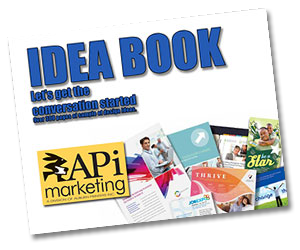 Browse our Idea Book filled with design ideas for almost every industry or profession. You can choose any of the designs and have them custom adapted to meet and exceed your expectations. Give it a try! When you are done browsing, contact us and tell us which ideas you would like to explore. Success in business today requires a strong web presence. Your website often creates the first impression your customers will experience, and may be the only thing to get them to pick up the phone and give you a call. View some sample website designs below.